Queulat National Park is situated 165 km north of the city Coyhaique and 180 km south of Chaitén. It was opened on 13th October in1983 and has a surface area of154 093 hectares, which start slightly north of Lake Risopatrón. You can access the park by travelling along the picturesque Ruta Austral, which was finished quite recently in1982 and which owes its construction to the effort and capabilities of the Chilean workmen. Over 40 km of the longitudinal Camino Austral crosses back and forwards into the park making it easier for you to admire its natural beauty. 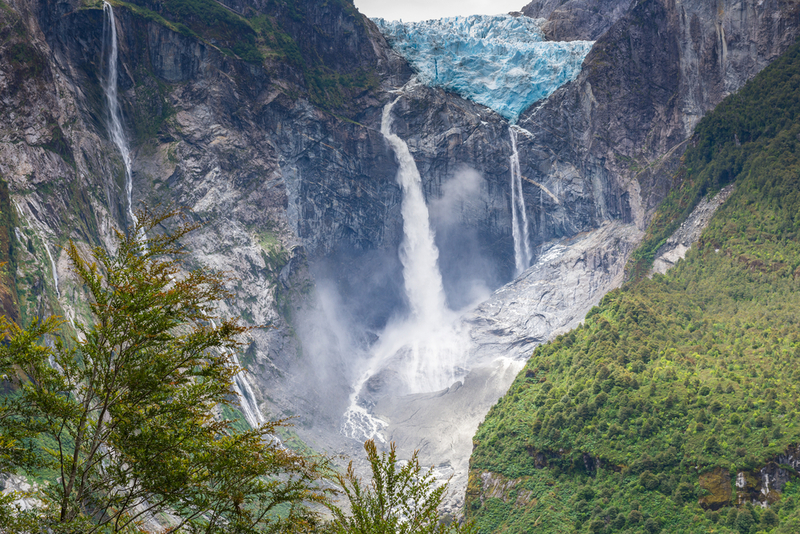 The most important attractions in this park are its glaciers and rivers but particularly the Queulat hanging glacier, el Salto del Padre García, Lake Risopatrón, the Lagoon of the Pumas, the area known as la Cuesta Queulat, Témpanos Lagoon and el Salto del Cóndor. You can visit the park from September through to April. There are lots of different activities you can do such as, hiking, boat trips, panoramic photography and observation, cycling along the Camino Austral, camping, picnics and fishing, amongst others. Queulat or Queolat (as it was originally called by the native,canoeing community known as the Chonos) means ‘the sound of waterfalls.’ It is wild and pure territory where you find the jungle – a wet, temperate, coastal forest – which is always green and crowned by the Andean glaciers and ice fields, not to mention the rich diversity of the Southern Pacific Ocean’s fiords and canals. No paths had ever crossed through this virgin jungle and no colonists had ever tried to make it accessible in fact a large part of it is still unexplored territory. This is the only park of its kind, in Chile, that you can reach by car. The park is located in the nortwest of the region, on the western slopes of the Patagonian Andes. Hence, its topography is checkered by rocky slopes, deep, sharp valleys and spectacular snowdrifts and hanging glaciers which are wonderful reminders of the last glaciation thousands of years ago. The highest peak in the park is Cerro Alto Nevado at 2225 metres above sea level and represents the source of the Ventisquero Colgante. It has a temperate, coastal climate with intense rainfall (between 3500 and 4 000 millimetres per year), particularly the western coast. Several rivers also cross through the park: the Queulat, Ventisquero, Bordalí and the Pedregoso. The vegetation in the park is typical of an evergreen, rainy, cold forest composed of majestic coigües, tepas, lumas, myrtle trees, tineos, mañios, cinnamon tress, ciruelillos as well as a copse forest with an endless variety of ferns, copihues, flowers, climbing plants, quilas, chilco and nalcas. The fauna in the park consists mainly of birds like the black woodpecker, chucao, huet-huet, cachaña and the kingfisher. Pudús, culpeo foxes, pumas and guiñas also live within the park. You can see dolphins, sea lions and a wide variety of sea birds like the beautiful black neck swan at the edge of the park or swimming in the Fiordo Queulat and Fiordo del Seno Puyuhuapi. Boat trips are only allowed in the Témpanos Lagoon in the hanging glacier sector. The main town is Puerto Puyuhuapi, located to the extreme north of the heart of the Ventisquero. It was founded in1932 by the first settlers – Augusto Grosse, Karl Ludwig and Otto Ubel. If you require accommodation in the park try the Ecolodge Fiordo Queulat en el Parque. In 1766/67 the Jesuit priest José García Alsué, left the Cailén Mission in Chile, and advanced into the river Queulat as far as the waterfall known as Salto Del Padre García. He was looking for the City of the Caesars because the natives had heard cannon fire and bells ringing which had come from the other side of the Andes. In1875 the then Capitain Enrique Simpson embarked on an exploration along the Aysén coastal region; he travelled around the Ventisquero and narrates that the Ventisquero Colgante located at 7 800 m above sea level was 100 m from the seashore. He refers to it as an anchorage for vessels. Lake Risopatrón sector: the first people to explore Lake Risopatrón, starting off from the Ventisquero, were Max Yunge and Müller, between 1928 and 1930. This is approximately 600 metres long and crosses over the Ventisquero river by means of a hanging rope bridge. This is a mountain path 3 200 metres long which goes through the evergreen forest ascending over the glacier’s moraines (ridges formed by glacial sediment). It has spectacular panoramic views of the glacier and the valley of the river Ventisquero. Via this path you can access the foot of the Padre García waterfall. It also offers a beautiful viewpoint within the rainy forest. The path is just 150 metres long. This is 1 700 metres long. It sets off 32 Km south of Puyuhuapi on the Carretera Austral, then heads up through the evergreen forest and goes beyond the edge of the forest. You then gain access to a lagoon which is at the foot of a rock wall – the rock formation resembles an amphitheater –where you will be able to watch icebergs. This is the source of the river Cascada. There is another path under construction which accesses the source of the river Queulat. They have already finished 4km of the path but the pedestrian bridges were destroyed by high river water which means that you are forced to wade through the river and require suitable clothing and footwear to do so. This path is 4 km long and is not as easily accessed; it is ideal for those who want to appreciate the beauty and diversity amidst the evergreen jungle.